Today was the last meeting of the year for the First Coast Pastel Society. It would normally be a plein air day but we were not sure what to expect of the weather for the first of December, so we decided to meet at the St. Augustine Art Association for a holiday get-together breakfast, and then work on still lifes we had set up. 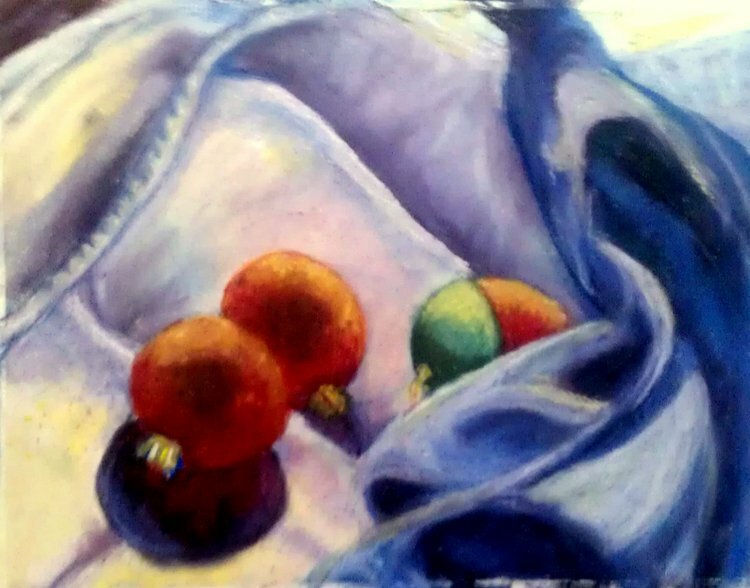 Since it's heading for Christmas the still lifes all featured Christmas tree ornaments. The weather was quite lovely in the morning and almost made us sorry not to be out in plein air, but halfway through the morning we had a rain squall pass through, which made the indoors seem pretty good! This is the painting I did, my usual 9x12 Art Spectrum.